Striker Jason Cummings is ready to step up to the plate at Charlton Athletic on Saturday if called upon by Luton boss Mick Harford. 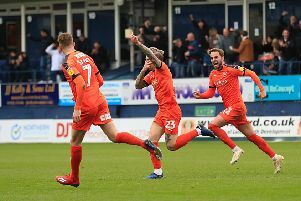 The 23-year-old scored a late equaliser as the Hatters drew 2-2 with Blackpool at Kenilworth Road last weekend. It’s a big game, a hard place to go, a massive pitch, but if I’m called upon, I’ll be ready. Top scorer James Collins will miss the trip to the Valley after being sent off against the Tangerines, while Kazenga LuaLua and Danny Hylton remain injury doubts. Cummings said: “It’s up to Mick isn’t it. “Mick picks the team, he might need to change it up a little bit because Kaz maybe picked up tweak, Collins out, but it’s up to Mick. Team-mate Pelly-Ruddock Mpanzu is confident Cummings will do the job if needed. He said: “We knew that Jase did well at Peterborough and now he’s here with us. Town chief Harford confirmed he won’t risk either LuaLua, who came off against the Tangerines, or Hylton if they are still struggling. He said: “He (LuaLua) had a bit of a tight hamstring, we’ll have to see how he is, we didn’t want to take any risks, so we got Kaz off. “Danny’s still got a bit of inflammation on his knee. Cummings: Teddy Sheringham? I’m Ruud van Cumm-dog!